It has been said many times over that a good swing starts with a proper grip. I am always pleasantly suprised when I meet a new student on the tee line that has a sound grip. These students usually have few compensations in their swing and tend to adjust to swing changes with much less difficulty than those with poor grips. Here is a checklist that you should pay close attention to if you are serious about improving. I like to keep things simple I am a firm believer that if you improve your grip, you will improve your golf swing. The best view of your grip would be to hold the club directly in front of you with your arms extended and your hands chest high (fig. #1). The web­bing between your left thumb and forefinger should be together with the thumb pad on the right center of the shaft. Notice how the second knuckle of the forefinger and the thumb nail are even with each other. 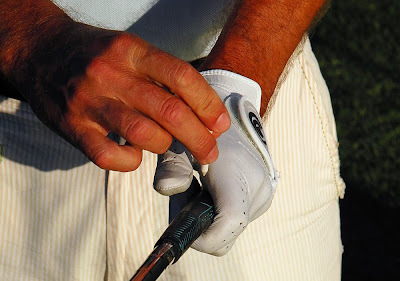 A very common error I see is when the left thumb is extended down the shaft. 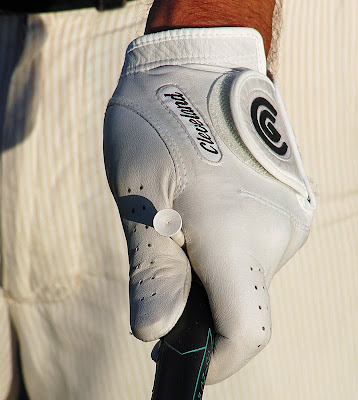 This causes the club to lay in the palm of the hand which increases grip pressure and decreases club head speed. The fleshy part of the right hand should cover the left thumb nail (fig.#2). The webbing should be close together and the thumb nail should be on the left center of the shaft. If these positions are accomplished, it does not matter which of the three grips are used (vardon, interlock, or ten finger). You should never see any of the grip from this view. All you should see is hands and fingers. Bobby Hinds is a Teaching Professional at Woodley Lakes Golf Course with over 10 years of teaching experience. If you have questions about your golf swing, email Bobby at bobbyhinds@aol.com He is available for lessons through the Pro Shop. For more information, go to BobbyHinds.com. 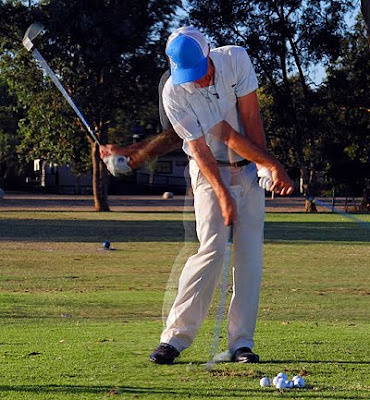 A great drill to teach you better balance during the golf swing which will result in straighter shots on the course.